Was watching “The Best Thing I Ever Ate” again (really need to give up this show for the sake of my weight) and they were discussing breakfast food. One person was totally off in my opinion when she stated that a certain maple syrup was better than anything Canada produced ( 😦 ) but then another chef described Pasta Mama. She mentioned that she loved it after working an overnight shift at the restaurant and then she would just go and collapse into bed. I remember shifts like that and as I was watching the program while my little girl did everything she could to keep me awake I could relate once again to the fatigue. 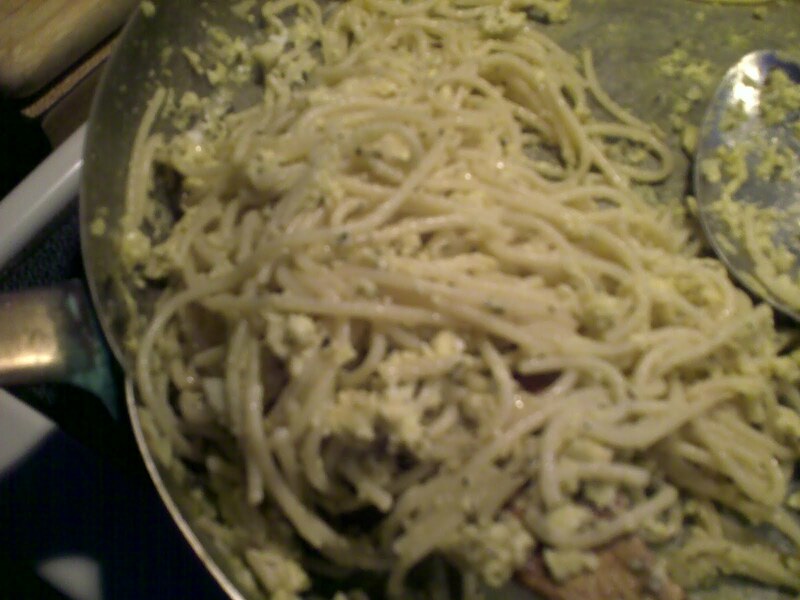 Eggs, pasta and parmesan cheese. Simple and perfect in theory and wonderful in taste. The original restaurant even has a nice video to go over how to make it. We’re having a friend over for dinner who is going to help us do some wiring. The very least that I can do is make something for him for dinner. This is from Jamie Oliver’s “Jamie’s Italy” book. The trick is the rub-he has a much more involved method that I have made a little more weekday friendly. I’m going to use a loin roast but I’ve made this with other cuts and it is still terrific. In a mortar and pestle combine and smash; 4 T. fennel seeds, 3 small dried chilies, 3 T. rock salt, 4 bay leaves (torn). Add the zest of a lemon and the juice of lemon. Rub all of the pork and put in the oven fat side up (if there is one). Put in the slowcooker for seven hours with a glass of white wine, two sprigs of rosemary and 3 garlic cloves cut in half. Not sure what we’ll have for dessert-this might just be a chocolate and fruit night as I’ve got to pack everything for a trip to Toronto early Friday morning. 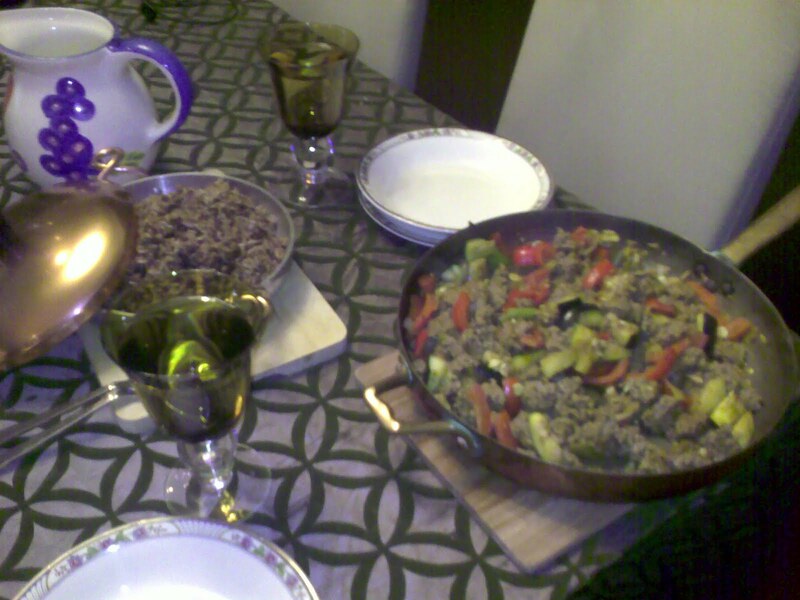 The keema was so easy and really satisfying. I changed it a little bit though as I didn’t want to make a side dish and I had a lot of beautiful vegetables I just sauteed them up before I added the meat. Thanks to my father-in-law being over and watching Madison for me I got a couple of extra things done too. 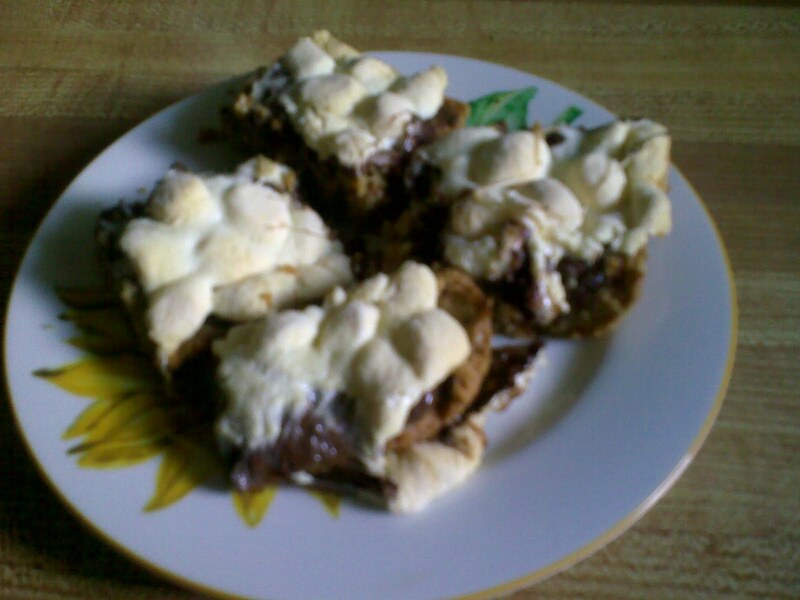 I made s’mores cookies. I found this recipe originally on the Martha Stewart site but I’ve changed it a bit since then. Bake for five more minutes. Then spread the chocolate. Bake until marshmallows are toasty looking. I even got crabapply jelly done which is just fantastic since the crabs in the front yard go from ready to rotten pretty quickly and I hate to waste them. 1.Remove stems and blossom ends from crabapples, and cut into quarters. Place them in a large stainless steel or other non-reactive pot or saucepan. Add enough water to be able to see, but no so much that the crabapples are floating. Bring to a boil, reduce heat to medium, and let simmer for 10 to 15 minutes. The apples should soften and change color. 2.Strain the apples and juice through 2 or 3 layers of cheese cloth. You should have at least 4 cups of juice. Discard pulp, and pour the juice back into the pan. Bring to a simmer, and let cook for 10 minutes. Skim off any foam that comes to the top. Next, stir in the sugar until completely dissolved. Continue cooking at a low boil until the temperature reaches 220 to 222 degrees F (108 to 110 C). Remove from heat. 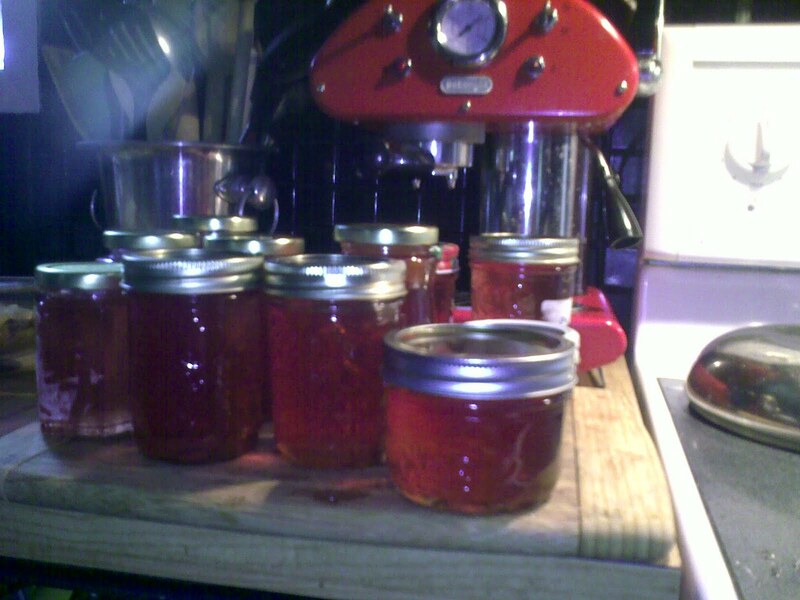 3.Pour the jelly into sterile small decorative jars leaving 1/4 inch headspace. Process in a hot water bath to seal. Tonight the organic bin comes and we have a varitety of things that need to be finished-up. We also have been eating way too much meat so tonight is a night for tempah. Heat a wok and add the oil. Add onion, coriander, garlic, red chili and saute for 1 minute. Add the coconut milk together with the tempeh, green chili, bay leaf and sugar. Simmer for 15 minutes. Remove bay leave. This got the thumb’s up from Peter who said that it would be perfect if it were cooked in coconut shells instead of ramekins. I won’t have much time but I want something fantastic and something that will be fairly light but that I have everything in the house for. I found this recipe awhile ago and can’t find the source. I apologize in advance. This is not my original recipe but I’m excited to try it out. Heat the oil in a skillet and add the onions. Cook, stirring, about 10 minutes, or until onions are browned. Add the garlic, ginger, and chilies and cook 2 minutes longer. Add the ground meat and cook, stirring and chopping the the spatula to break up any lumps. Cook until the meat begins to brown. Sprinkle with turmeric and salt and stir. Add the water, cover, and cook over low heat about 25 minutes, stirring often to prevent sticking. When ready, all liquid should be absorbed. If it is not, uncover and cook until it is evaporated. Stir in the garam masala, lemon juice, and coriander. Serves 4. 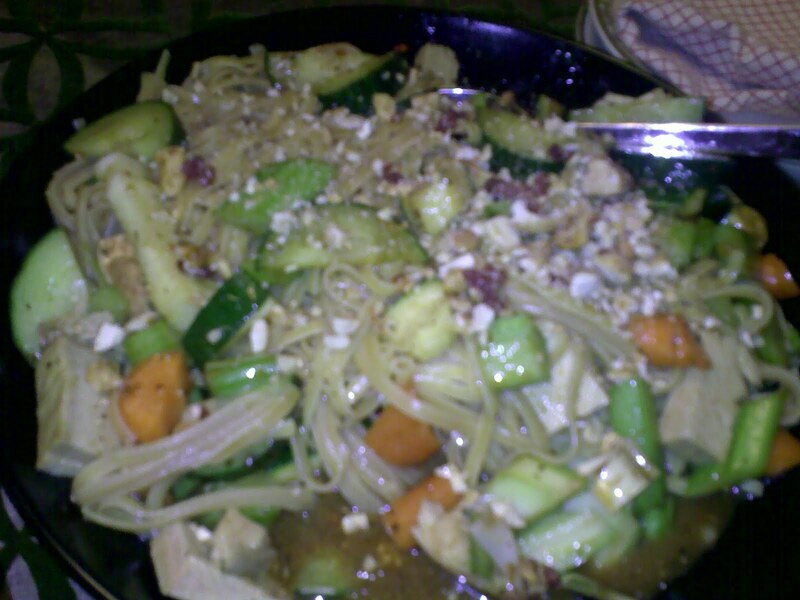 We had leftover chicken and pork as well as, lots of extra fresh vegetables so tonight we had thai noodles with cashews on the top. So good and great as leftovers. My father-in-law was telling us a story about a coconut custard that he had during the war when he was stationed in Burma. I can’t get the idea out of my head and I’m hoping that this will be the recipe that fits his memory. We are lucky enough to have in back at a our house tonight as he is arriving home from England. Combine eggs and sugar in bowl then using whisk blend until creamy. Slowly whisk in coconut milk then vanilla. Strain and pour into eight ramekins. Place ramekins in water bath with water 3/4 way up sides of ramekins. Bake 45 minutes then remove and allow to cool completely. Spread coconut on sheet pan and place in oven until lightly toasted about 5 minutes. 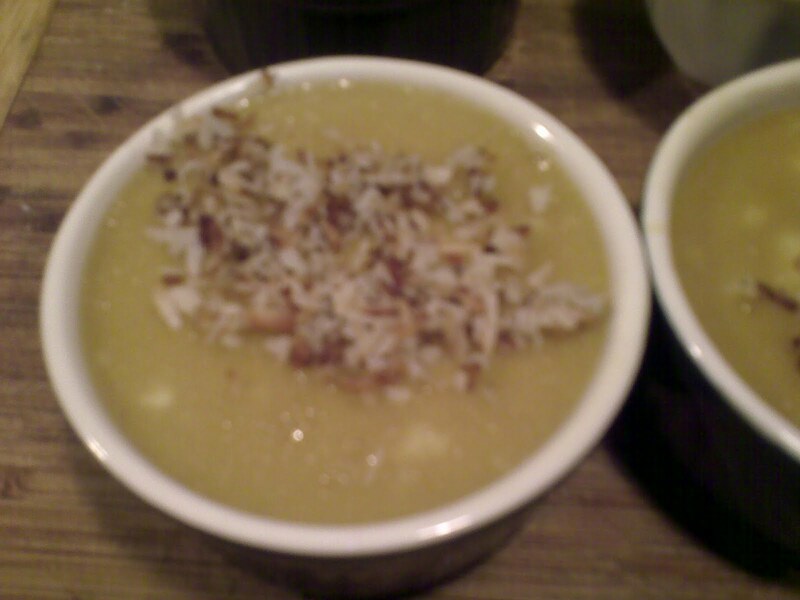 Spread coconut on custard right before serving.